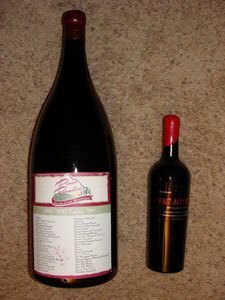 In most cases the average price per bottle of wine is a good indication of what most of the Winery's product will cost. However, the average price per bottle can be a misleading statistic if the reader is not sure what is included. A number of wineries make multiple brands from a single facility, for different purposes. One could be a high end wine and is available only from the winery. Another could be lower end, suitable for distribution or restaurant sales. Also, a single bottle of expensive reserve wine can heavily skew the results. A winery that produces 5 bottles that sell for $20 apiece can look much more expensive if a high-end reserve that sells for a $150 is also included. Excluding the $150 bottle would leave an average price of $20. Including it would give an average of almost $42. -	only 750 ml bottles (the standard bottle size, are included). Magnums or splits are not included in calculations.